Feyris has a ten year alternate life. In Steins;Gate episode 17 Okabe gets beat up, Feyris lives a 10 year dream, and Christina gets jealous. Feyris-nyan and Okabe develop a special relationship. Okabe is using the working theory that unwinding the D-mails will restore the IBN computer that will enable the Future Gadget Lab to somehow prevent SERN from knowing about their time travel experiments which will, in turn, keep Mayurii alive. Convincing Feyris to counter-act her D-Mail turns out to be both more difficult and less difficult than Okabe anticipates. First Okabe has to defend Feyris from a group of VERY competitive Rei-net players, then he has to convince her to give up her father’s life. In the end, the IBN computer is delivered to the shrine, as before, but it still goes missing at the shrine. Following this logic, Okabe will need to unwind more D-Mails. I personally think he should focus on preventing Moeka from getting any information about their activities, but we’ll have to wait and see where Okabe’s logic takes him. One part that was a bit strange was the suggestion that Feyris developed Reading Steiner (that is that she remembers the alternate world-line). It is difficult to know whether this is true or not, although she did remember a different world-line in the other world-line. Confusing. Another disturbing issue is how far back are they going to have to peel this onion? If they keep peeling they will return to a world in which Christina is dead. I don’t think Feyris developed the reading steiner, but perhaps there are residual memories left of previous world lines. Maybe with a powerful enough stimulous, the memories can be triggered. In this case, the stimulus was the cafe that Feyris helped build. I wonder if this means everybody can regain their past world line memories…? I’m not sure what to make of the Feyris memories. Personally I think that was a story-telling mistake, as it muddies things (does she have reading steiner? can Okabe “restore” alternate world-line memories? can other people spontaneously recover alternate world-line memories?) Unless there was a plot reason for adding this ambiguity, they probably should have avoided this can of worms. 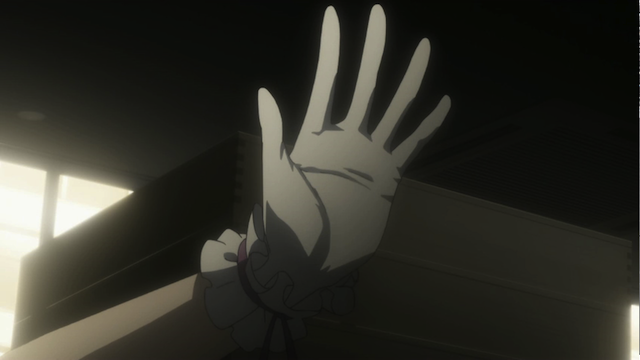 Regarding Makise Kurisu, her death certainly is the final hurdle in some sense or another. The first episode (in which she dies) was titled something like, “prologue of the beginning and the end”. I don’t know how it will all fit together, but that is going to have to be revisited for one reason or another.